Other classification systems exist. One of the first published attempts was in 1951. The National Institutes of Health developed a classification system in 1962. The classification uses numeric codes. The top, one-digit diagnostic level includes 13 headache groups. The first four of these are classified as primary headaches, groups 5-12 as secondary headaches, cranial neuralgia, central and primary facial pain and other headaches for the last two groups. The ICHD-2 classification defines migraines, tension-types headaches, cluster headache and other trigeminal autonomic cephalalgias as the main types of primary headaches. Also, according to the same classification, stabbing headaches and headaches due to cough, exertion and sexual activity (coital cephalalgia) are classified as primary headaches. The daily-persistent headaches along with the hypnic headache and thunderclap headaches are considered primary headaches as well. Secondary headaches are classified based on their etiology and not on their symptoms. According to the ICHD-2 classification, the main types of secondary headaches include those that are due to head or neck trauma such as whiplash injury, intracranial hematoma, post craniotomy or other head or neck injury. Headaches caused by cranial or cervical vascular disorders such as ischemic stroke and transient ischemic attack, non-traumatic intracranial hemorrhage, vascular malformations or arteritis are also defined as secondary headaches. This type of headaches may also be caused by cerebral venous thrombosis or different intracranial vascular disorders. Other secondary headaches are those due to intracranial disorders that are not vascular such as low or high pressure of the cerebrospinal fluid pressure, non-infectious inflammatory disease, intracranial neoplasm, epileptic seizure or other types of disorders or diseases that are intracranial but that are not associated with the vasculature of the central nervous system. ICHD-2 classifies headaches that are caused by the ingestion of a certain substance or by its withdrawal as secondary headaches as well. This type of headache may result from the overuse of some medications or by exposure to some substances. HIV/AIDS, intracranial infections and systemic infections may also cause secondary headaches. The ICHD-2 system of classification includes the headaches associated with homeostasis disorders in the category of secondary headaches. This means that headaches caused by dialysis, high blood pressure, hypothyroidism, and cephalalgia and even fasting are considered secondary headaches. Secondary headaches, according to the same classification system, can also be due to the injury of any of the facial structures including teeth, jaws, or temporomandibular joint. Headaches caused by psychiatric disorders such as somatization or psychotic disorders are also classified as secondary headaches. The NIH system of classification is more succinct and only describes five categories of headaches. In this case, primary headaches are those that do not show organic or structural etiology. According to this classification, headaches can only be vascular, myogenic, cervicogenic, traction and inflammatory. The most common types of headache are the "primary headache disorders", such as tension-type headache and migraine. They have typical features; migraine, for example, tends to be pulsating in character, affecting one side of the head, associated with nausea, disabling in severity, and usually lasts between 3 hours and 3 days. Rarer primary headache disorders are trigeminal neuralgia (a shooting face pain), cluster headache (severe pains that occur together in bouts), and hemicrania continua (a continuous headache on one side of the head). "Thunderclap headache" may be the only symptom of subarachnoid hemorrhage, a form of stroke in which blood accumulates around the brain, often from a ruptured brain aneurysm. Headache with fever may be caused by meningitis, particularly if there is meningism (inability to flex the neck forward due to stiffness), and confusion may be indicative of encephalitis (inflammation of the brain, usually due to particular viruses). Headache that is worsened by straining or a change in position may be caused by increased pressure in the skull; this is often worse in the morning and associated with vomiting. Raised intracranial pressure may be due to brain tumors, idiopathic intracranial hypertension (IIH, more common in younger overweight women) and occasionally cerebral venous sinus thrombosis. Headache together with weakness in part of the body may indicate a stroke (particularly intracranial hemorrhage or subdural hematoma) or brain tumor. Headache in older people, particularly when associated with visual symptoms or jaw claudication, may indicate giant cell arteritis (GCA), in which the blood vessel wall is inflamed and obstructs blood flow. Carbon monoxide poisoning may lead to headaches as well as nausea, vomiting, dizziness, muscle weakness and blurred vision. Angle closure glaucoma (acute raised pressure in the eyeball) may lead to headache, particularly around the eye, as well as visual abnormalities, nausea, vomiting and a red eye with a dilated pupil. Headache often results from traction to or irritation of the meninges and blood vessels. The nociceptors may also be stimulated by other factors than head trauma or tumors and cause headaches. Some of these include stress, dilated blood vessels and muscular tension. Once stimulated, a nociceptor sends a message up the length of the nerve fiber to the nerve cells in the brain, signaling that a part of the body hurts. Primary headaches are even more difficult to understand than secondary headaches. Although the pathophysiology of migraines, cluster headaches and tension headaches is still not well understood, there have been different theories over time which attempt to provide an explanation of what exactly happens within the brain when individuals suffer from headaches. One of the oldest such theories is referred to as the vascular theory which was developed in the middle of the 20th century. The vascular theory was proposed by Wolff and it described the intracranial vasoconstriction as being responsible for the aura of the migraine. The headache was believed to result from the subsequent rebound of the dilatation of the blood vessels which led to the activation of the perivascular nociceptive nerves. The developers of this theory took into consideration the changes that occur within the blood vessels outside the cranium when a migraine attack occurs and other data that was available at that time including the effect of vasodilators and vasoconstrictors on headaches. The neurovascular approach towards primary headaches is currently accepted by most specialists. According to this newer theory, migraines are triggered by a complex series of neural and vascular events. Different studies concluded that individuals who suffer from migraines but not from headache have a state of neuronal hyperexcitability in the cerebral cortex, especially in the occipital cortex. People who are more susceptible to experience migraines without headache are those who have a family history of migraines, women, and women who are experiencing hormonal changes or are taking birth control pills or are prescribed hormone replacement therapy. While, statistically, headaches are most likely to be primary (non serious and self-limiting), some specific secondary headache syndromes may demand specific treatment or may be warning signals of more serious disorders. Differentiating between primary and secondary headaches can be difficult. As it is often difficult for patients to recall the precise details regarding each headache, it is often useful for the sufferer to fill-out a "headache diary" detailing the characteristics of the headache. Electroencephalograms have not been found to be useful in working up this symptom. One type of treatment, however, is usually not sufficient for chronic sufferers and they may have to find a variety of different ways of managing, living with, and seeking treatment of chronic daily headache pains. There are however two types of treatment for chronic headaches, i.e. acute abortive treatment and preventive treatment. Whereas the first is aimed to relieve the symptoms immediately, the latter is focused on controlling the headaches that are chronic. For this reason, the acute treatment is commonly and effectively used in treating migraines and the preventive treatment is the usual approach in managing chronic headaches. The primary goal of preventive treatment is to reduce the frequency, severity, and duration of headaches. This type of treatment involves taking medication on a daily basis for at least 3 months and in some cases, for over 6 months. The medication used in preventive treatment is normally chosen based on the other conditions that the patient is suffering from. Generally, medication in preventive treatment starts at the minimum dosage which increases gradually until the pain is relieved and the goal achieved or until side effects appear. To date, only amitriptyline, fluoxetine, gabapentin, tizanidine, topiramate, and botulinum toxin type A (BoNTA) have been evaluated as "prophylactic treatment of chronic daily headache in randomized, double-blind, placebo-controlled or active comparator-controlled trials. Antiepileptics can be used as preventative treatment of chronic daily headache and includes Valproate. Psychological treatments are usually considered in comorbid patients or in those who are unresponsive to the medication. Primary headaches account for more than 90% of all headache complaints, and of these, episodic tension-type headache is the most common. It is estimated that women are three times more prone than men to suffer from migraines. Also, the prevalence of this particular type of headache seems to vary depending on the specific area of the world where one lives. However, migraines appear to be experienced by 12% to 18% of the population. Cluster headaches are thought to affect less than 0.5% of the population, though their prevalence is hard to estimate because they are often mistaken for a sinusal problem. However, according to the existent data, cluster headaches are more likely to occur in men than women, given that the condition tends to affect 5 to 8 times more men. The first recorded classification system that resembles the modern ones was published by Thomas Willis, in De Cephalalgia in 1672. In 1787 Christian Baur generally divided headaches into idiopathic (primary headaches) and symptomatic (secondary ones), and defined 84 categories. Children can suffer from the same types of headaches as adults do although their symptoms may vary. Some kinds of headaches include tension headaches, migraines, chronic daily headaches, cluster headache and sinus headaches. Dental braces and orthodontic headgear (due to the constant pressure placed on the jaw area) are also known for causing occasional to frequent headaches in adolescents. It is actually common for headaches to start in childhood or adolescence, for instance, 20% of adults who suffer headaches report that their headaches started before age 10 while 50% report they started before age 20. The incidence of headaches in children and adolescents is very common. One study reported that 56% of boys and 74% of girls between 12 and 17 indicated having experienced a form of headache within the past month. The causes of headaches in children include either one factor or a combination of factors. Some of the most common factors include genetic predisposition, especially in the case of migraine; head trauma, produced by accidental falls; illness and infection, for example in the presence of ear or sinus infection as well as colds and flu; environmental factors, which include weather changes; emotional factors, such as stress, anxiety, and depression; foods and beverages, caffeine or food additives; change in sleep or routine pattern; loud noises. Also, excess physical activity or sun may be a trigger specifically of migraine. Although most cases of headaches in children are considered to be benign, when they are accompanied with other symptoms such as speech problems, muscle weakness, and loss of vision, a more serious underlying cause may be suspected: hydrocephalus, meningitis, encephalitis, abscess, hemorrhage, tumor, blood clots, or head trauma. In these cases, the headache evaluation may include CT scan or MRI in order to look for possible structural disorders of the central nervous system. Some measures can help prevent headaches in children. Some of them are drinking plenty of water throughout the day; avoiding caffeine; getting enough and regular sleep; eating balanced meals at the proper times; and reducing stress and excess of activities. ^ BROWN MR (September 1951). "The classification and treatment of headache". Med. Clin. North Am. 35 (5): 1485–93. PMID 14862569. ^ Ad Hoc Committee on Classification of Headache (1962). "Classification of Headache". JAMA 179 (9): 717–8. doi:10.1001/jama.1962.03050090045008. ^ Jes Olesen, Peter J. Goadsby, Nabih M. Ramadan, Peer Tfelt-Hansen, K. Michael A. Welch (2005). The Headaches (3 ed.). Lippincott Williams & Wilkins. ISBN 0-7817-5400-3. ^ Morris Levin, Steven M. Baskin, Marcelo E. Bigal (2008). Comprehensive Review of Headache Medicine. Oxford University Press US. ISBN 0-19-536673-5. ^ a b c d e Scottish Intercollegiate Guideline Network (November 2008). Diagnosis and management of headache in adults. Edinburgh. ISBN 978-1-905813-39-1. ^ a b c d Edlow JA, Panagos PD, Godwin SA, Thomas TL, Decker WW (October 2008). "Clinical policy: critical issues in the evaluation and management of adult patients presenting to the emergency department with acute headache". Ann Emerg Med 52 (4): 407–36. doi:10.1016/j.annemergmed.2008.07.001. PMID 18809105. ^ Goadsby PJ (January 2009). 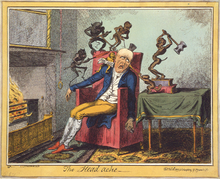 "The vascular theory of migraine--a great story wrecked by the facts". Brain 132 (Pt 1): 6–7. doi:10.1093/brain/awn321. PMID 19098031. ^ "Pathophysiology and Treatment of Migraine and Related Headache". Retrieved 2010-08-06. ^ "Migraine Without Headache". Retrieved 2010-08-06. ^ Gronseth, GS; Greenberg, MK (1995 Jul). "The utility of the electroencephalogram in the evaluation of patients presenting with headache: a review of the literature". Neurology 45 (7): 1263–7. doi:10.1212/WNL.45.7.1263. PMID 7617180. ^ Sun Y, Gan TJ (December 2008). "Acupuncture for the management of chronic headache: a systematic review". Anesth. Analg. 107 (6): 2038–47. doi:10.1213/ane.0b013e318187c76a. PMID 19020156. ^ Linde, K.; Allais, G.; Brinkhaus, B.; Manheimer, E.; Vickers, A.; White, AR. ; Linde, Klaus (2009). "Acupuncture for tension-type headache". In Linde, Klaus. Cochrane Database Syst Rev (1): CD007587. doi:10.1002/14651858.CD007587. PMC 3099266. PMID 19160338. ^ a b Linde, K.; Allais, G.; Brinkhaus, B.; Manheimer, E.; Vickers, A.; White, AR. ; Linde, Klaus (2009). "Acupuncture for migraine prophylaxis". In Linde, Klaus. Cochrane Database Syst Rev (1): CD001218. doi:10.1002/14651858.CD001218.pub2. PMC 3099267. PMID 19160193. ^ a b "Pathophysiology and Treatment of Migraine and Related Headache". Retrieved June 21, 2010. ^ Amal Mattu; Deepi Goyal; Barrett, Jeffrey W.; Joshua Broder; DeAngelis, Michael; Peter Deblieux; Gus M. Garmel; Richard Harrigan; David Karras; Anita L'Italien; David Manthey (2007). Emergency medicine: avoiding the pitfalls and improving the outcomes. Malden, Mass: Blackwell Pub./BMJ Books. p. 39. ISBN 1-4051-4166-2. ^ a b "Headache". Retrieved 2010-08-06. ^ "Children Headaches Are Not Made Up". Retrieved 2010-06-30. ^ "How Common Are Headaches in Children and Adolescents?". Retrieved 2010-06-30. ^ "What Causes Headaches in Children and Adolescents?". Retrieved 2010-06-30. ^ "Headaches in Children". Retrieved 2010-06-30. Phoenix Chiropractor | Headaches. Dr. James Koop is a Phoenix Chiropractor.